Home > Children & Ear Health > What is Glue Ear? 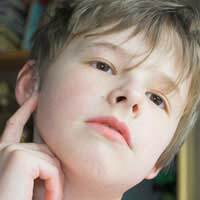 Glue ear is a condition that is very common in childhood, affecting almost three quarters of all children at some point.Though it is common in children, glue ear can affect anybody of any age and can affect either one or both ears. What Exactly is Glue Ear? Glue ear occurs when the space in the middle ear becomes congested with a sticky, glue like substance that, because of its density, can affect hearing and balance. As the Eustachian tube fills with this fluid, sound waves are prevented from being transmitted effectively and reaching the ear drum. This can cause sounds to become muffled, dull or even go unheard. This condition is often thought to be associated with coughs and colds and can be a consequence of being congested. As the spaces of the ear and Eustachian tube become blocked, the material can develop an infection causing the sticky substance to form and become difficult to clear. It is not only infections that are to be blamed for glue ear as research has found that those living or working in a smoky atmosphere are more at risk as are babies that are bottle and not breast fed and those whose siblings previously suffered form the condition. If an infection is the cause of the glue ear, the person may develop earache and a temperature. As it can occur in very young children they may have difficulty communicating this to their carer and signs may be pulling at the ears, constant crying, a lack of appetite and being hot, red and sweaty. It is important that a baby’s temperature is monitored and treated with paracetamol preparations if it begins to climb. The most common course of treatment for glue ear, especially in the young is to allow the ear time to try and heal itself. Due to the increase in ‘superbugs’, the use of anti-biotics is being reduced in unnecessary cases in order to help people become more resistant to less harmful bacteria and allowing the drugs to target the more damaging kind. Most GP’s will advise the patient to return after a certain period of time if the symptoms are still present.Whilst this period of time passes hearing aids may be indicated and, in the presence of an infection, you will be advised to avoid submersion under water to help prevent the infection from being pushed deeper in to the ear structures. If the symptoms persist long term surgery may be required to insert grommets into the ear drum to help the fluid drain away and to keep the ear drum open preventing the infection from continuing.Occasionally a method called ‘balloon therapy’ will be advised; this involves the use of an inflation device, inserted up the nose and blown up causing pressure on the Eustachian tube, encouraging it to open, allowing the fluid to drain away. This process will often need to be performed regularly until all of the fluid has drained away. Glue ear is a very common and usually non-serious condition of the ear, highly prevalent in children. Many cases of glue ear do not require active treatment and will cure in its own time.